I am going away this weekend, I haven't been away in so long so I am excited for this brief break with my church friends. My bags are packed, new books have been downloaded, caramel slice has been made and my anxiety has been locked away in a box (I wish that were possible! So instead I am just doing my best to ignore it and put it out of my mind for the weekend). The past couple of weeks have been highly emotional so last Sunday I just crashed and pretty much stayed curled up on the couch watching Chesapeake Shores. I saw my psych on Tuesday which was perfect timing and I found it was great to get her thoughts on a few things including the job hunt. I find with my anxiety I can dip at times and it takes me a while to get out of those dips so it's something I am working on and hoping that any more dips won't take me as long to get out of. My psych gave me some reading to do regarding negative thinking and just coping in general, which looks like it will be helpful. My anxiety has been running rampant lately regardless of what I do and I am overthinking every little thing, plus feeling jumpy and just wanting to hide. A big part of me wants to just give up on everything and hide for the rest of my life but I know that isn't practical, so I am giving it all to God and taking it one day at a time. Chesapeake Shores - I came across this series on Netflix last week and I really enjoyed it, it was good wholesome viewing and I loved getting to know all the O'Brien clan. It reminds me a bit of Parenthood but set on the coast and with a bit less drama. It's really nice getting to know all the siblings and how they each have their own struggles and where they fit in with the families dynamics. It's done by the same people as Good Witch so if you loved that you will love this. Goodbye by Echosmith - Echosmith have finally released some new music and it was well worth the wait! I love Echosmith (Cool Kids, Safest Place and Bright are some of my favourite songs of all time), so I downloaded the song the moment it came out and it will now be in heavy rotation on my iPod. I can't wait for their new album to come out (29th September) and if this song is anything to go by it will be an amazing album. Once and For All by Sarah Dessen - this is one of the books downloaded on my Kobo ready to be read. I love Sarah's books and find they are perfect holiday reads for when you want something light and fun. I first read Sarah's books in high school and I still love them, they are all standalone novels too but set in the same settings. If I need a break from the craziness of this weekend you can find me curled up reading this book. Nokia 6 - yesterday I finally got a new phone! You know how some people are loyal to iPhones, Samsung's etc I am loyal to Nokia. My old phone was Nokia Lumia 520 and it was still going strong (despite being dropped multiple times) after 3 years but it was 2g and as of the start of August that would be switching off so I needed a 3g phone or higher to keep getting decent reception. I was thrilled when it was announced they would bringing out new Nokia's that would be android (my 520 ran on Windows which was not fun!) and for $400 outright for the top model I could actually afford a new phone. It's a great phone and with it being a Nokia I know it will last (though I have ordered a case for it), my parents already have their eyes on buying themselves one. I will say it uses a Nano SIM but some googling showed me how I could cut my micro SIM into a nano and I have had no problems with it. 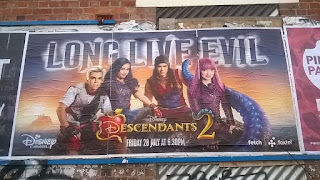 Descendents 2 - so I was minding my own business out and about and I spotted this poster on the side of a building. It was so funny to see it (and unexpected, apparently putting posters up on buildings is still a thing?) and I sent the pic to Megan (who is obsessed with the movie and even insists on getting called Mal at times! ), it made her day. You can also download the complete soundtrack and if that's anything to go by the movie should be amazing.